2017 was a mixed year in terms of reviews. While Wonder Woman was an absolutely wonderful movie that broke records, raised hopes for the DCEU, and set the pace for Superheroine movies, Justice League all but destroyed everything before the year ran out due to the mixed reviews and the poor box-office gross. Regardless, the DCEU is still moving along with it’s plans to build a great cinematic universe, and this December, Aquaman will dive into cinemas as Jason Momoa returns to play the eponymous character he was in Justice League. The underwater stuff has never been executed like this before. The visual effects shots coming in are just beautiful. James can switch modes from horror to big bright colorful action to really emotional scenes. He’s so able to hit all these different genres. Among Geoff Johns’ many writing credits was penning the Aquaman book at the start of the New 52 comicbook reboot, and he also worked on the character during the Green Lantern’s comic book Brightest Day event and his Justice League run. So obviously he’s well-versed with Arthur Curry, and hearing that he’s impressed with what director James Wan has accomplished ideally bodes well. [Aquaman has] got the great action you expect, it’s got a lot of great humor, it works on so many levels … it’s a testament to James’ unique vision. I think it’s an extraordinary step in DC Universe that sets it on the right path. Along with passing along the praise from the above DC brass, EW reported that Aquaman is said to be “visually more punchy and with more humor” compared to some of the Zack Snyder-directed DCEU movies. It’s worth remembering that because these people work for DC/Warner Bros, it’s doubtful you’d hear them outright criticizing Aquaman ahead of time, as they don’t want to steer moviegoers away from checking it out this winter. 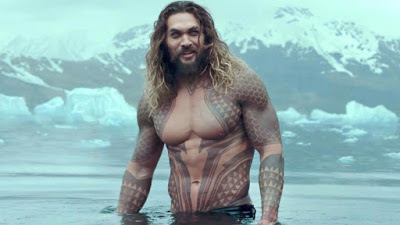 Nevertheless, between the talented cast assembled and much of the story taking place underwater, a realm that hasn’t been deeply (pun intended) explored in other superhero movies, Aquaman sounds like it will be a unique blockbuster. Aquaman dives into theaters on December 21.